Hi friends! I'm back today with another DIY art project (between my rustic wooden sign, my painters tape abstract art and my gallery wall, I'm all over the DIY art world lately, aren't I?!). I actually made this little gal a few weeks ago, but forgot to share here on the old blog! I was looking for something to add to the gallery wall in my office. I've made the office whimsical and colorful (think: stripes and paper mache deer head), so I knew that had to be the direction with this piece as well. And inexpensive of course... you know I like to keep it el-cheapo around the Ten June house! Ta-da. I made a little DIY nailhead trim art. Want to make one yourself? Here's how. 1. 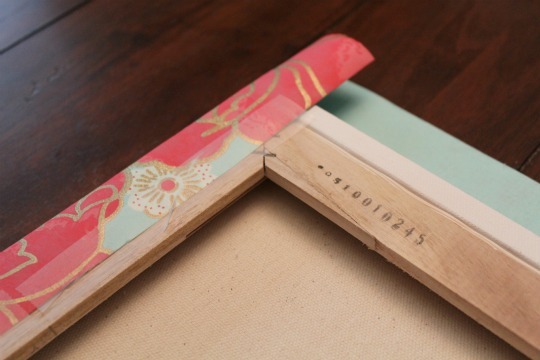 Wrap the canvas with the scrapbook paper or gift wrap as if you were wrapping a birthday gift, taping or stapling the paper in place on the back of the canvas. Crease the corners for a crisper look. 2. 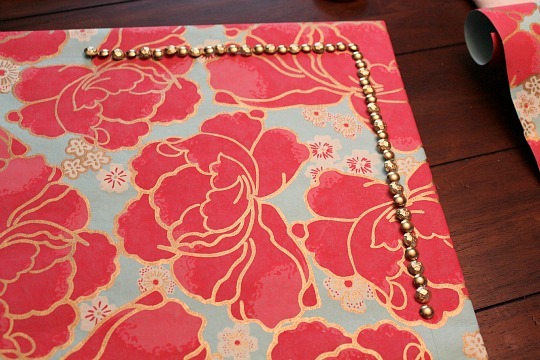 After measuring an outline onto the paper with a measuring tape and pencil, hammer the nailhead trim into place around the canvas. It’s much easier once you have penciled in a pattern to follow. And that’s it, folks! Two simple steps. You could even create basic patterns with the nailhead trim across the canvas, such as a chevron or diamond pattern. This wall art is personalized, looks custom and will cost you less than $20 per piece. And now this little gal is looking fabulous in my office, dontcha think? Have you DIYed any wall art lately? I love it!! I love ANYTHING with nailheads. They are just so classy. 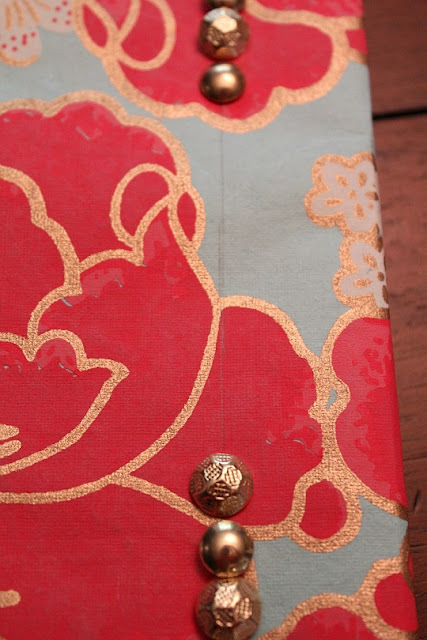 Beautiful fabric, too! Cute! Love that it was a DIY as well. So cute! 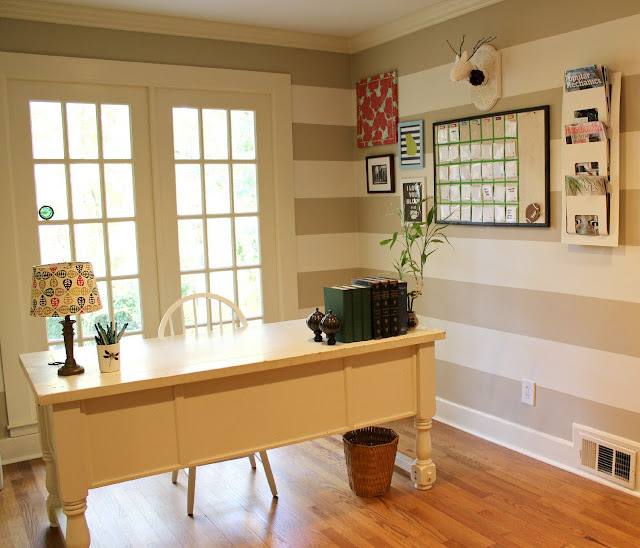 I need to do something like that for my gallery wall. Oohh--I love this. It looks so great on your wall. I think I must make one asap. :) So simple too---perfect! Very cute! I love the other art pieces in your office too! Fun wall art...love the pattern of the fabric! The tacks really dress it up and add that touch of super-hot brass. What a great way to incorporate a hit of a trend. I love how yours is so bright and cheery! Have a great week! Such a fabulous idea!!! Love it! Very pretty. I love how you used different nail heads. Love the office! oooh looks lovely! Adds the perfect kick to that wall. Great idea! It would be really great with some cork underneath for a beautiful bulletin board! Love the fabric! It looks great on your wall! I recently completed our kitchen gallery art wall and I'm moving onto a family inspiration wall now. Love your stripes! 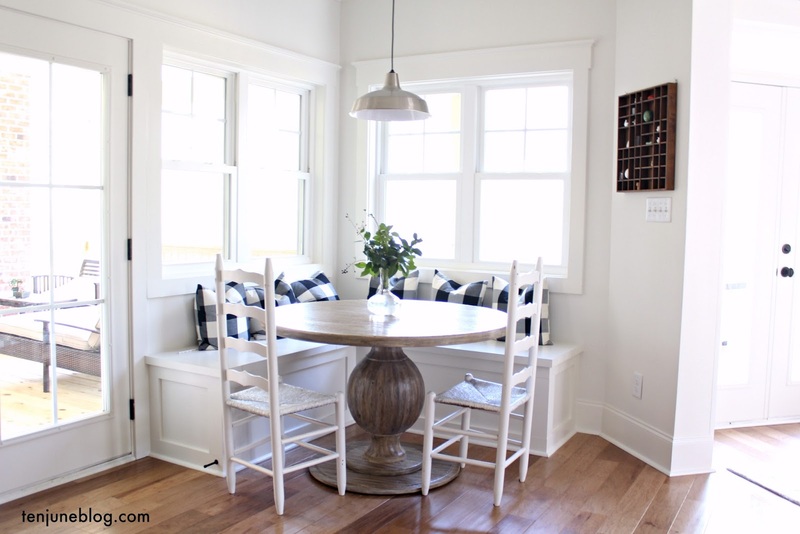 I just recently found your blog via Honey Were Home and I really enjoy it. 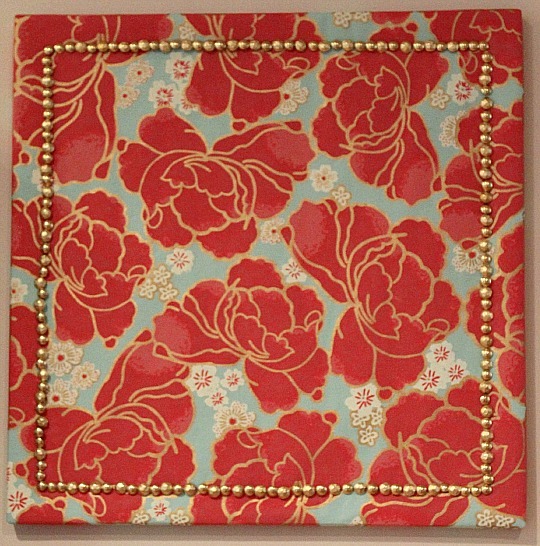 I love the Nailhead art, would be perfect for our home office! I recently used leftover fabric to make wall art for our master bedroom. Here is the link. That is darling! What a great idea for wall art. lovelovelove this! 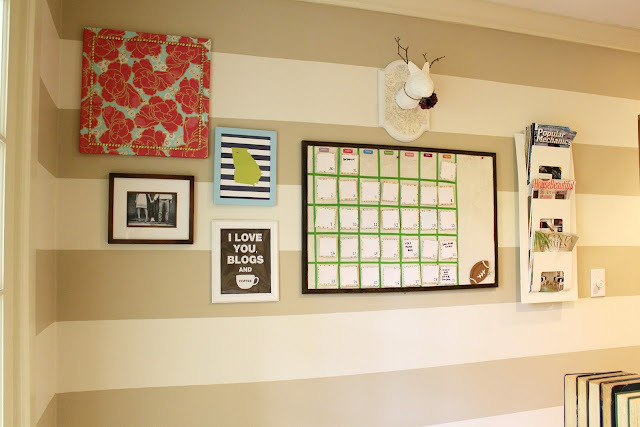 also I'm loving all up on your wall stripes!! !